The SQL Server Instance step of the wizard is available if you have selected to configure installation settings manually. You can select a Microsoft SQL Server on which you want to deploy the configuration database, and choose the authentication mode. For machines running Microsoft Windows Server 2008 or Microsoft Windows Server 2008 R2, the setup will install Microsoft SQL Server 2012 SP3 Express Edition. For machines running Microsoft Windows Server 2012 and later, the setup will install Microsoft SQL Server 2016 SP2 Express Edition. If a Microsoft SQL Server is already installed locally or remotely, select the Use existing instance of SQL Server option. Enter the instance name in the HOSTNAME\INSTANCE format. 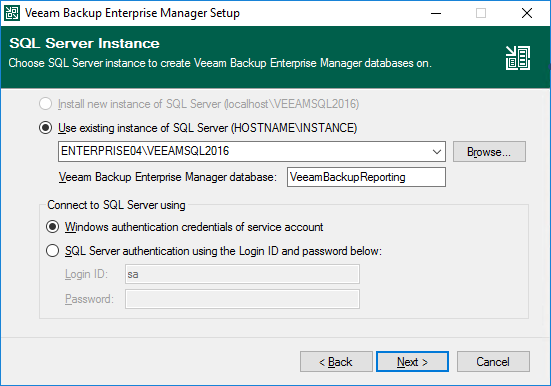 In the Database field, specify a name for the Veeam Backup Enterprise Manager configuration database. Select an authentication mode to connect to the Microsoft SQL Server instance: Microsoft Windows authentication or Microsoft SQL Server authentication. If you select the SQL Server authentication, enter credentials for the Microsoft SQL Server account. If the configuration database already exists on the Microsoft SQL Server (for example, it was created by a previous installation of Veeam Backup Enterprise Manager), the setup wizard will notify about it. To connect to the detected database, click Yes. If necessary, Veeam Backup Enterprise Manager will automatically upgrade the database to the latest version.